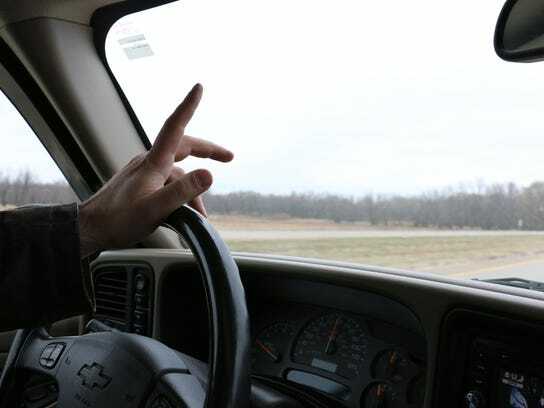 The One Finger Salute — Not to be confused with the New York one finger salute, this is the minimum amount a Midwesterner will do while driving past in their car. It’s a way of maintaining their reputation for Midwestern politeness, while still offering the disregard of a New York one finger salute. The Jaw Dropper — The Jaw Dropper is usually someone in their 70’s or 80’s who slowly crawls by, mouth agape, completely unsure what they have just seen. Somewhere between our dirt sooty faces, tattered clothes, and their inability to read our sign, these people stare with a bewildered, confused look at us. They never stop, but we suspect the Jaw Droppers are the ones who typically call the police on us. Presumably to report the couple that has been walking across America since the Dust Bowl. The Break Eye Contact — We know these people see us. We see them see us. We’re hard to miss, and we wave pretty vigorously to make sure we’re hard to miss. These people look away so quickly, their heads 180 degrees like The Exorcist. We’re guessing they see our cart and look away from a combination of awkwardness and fear that we have a baby in our cart. Or they’re evil people. They’re probably evil. People Come Bearing Gifts — Beers, bibles, and baloney are just a few of the ways these #roadangels bless us with their presence. One day it is 90 degrees out, and someone gifts us with a cooler of Gatorade. The next day, we are easing along casually, and we get bombarded with pamphlets about the nearest Jim Bakker gathering. Sometimes it takes all our self control not to drop to your knees and thank them, and other days all we can do is grit our teeth as we receive our 12th copy of the Our Father. We are always grateful to these road angels though, whether they’re giving us food, water, or something to talk about. People who reverse towards us — Perhaps the most terrifying of the bunch, this group is both well-intentioned and misguided. They’ll pass by us on the road, see our sign, and slam on their brakes. They’ll reverse towards us down the highway, as they roll their window down, and take their eyes off the road. The problem is, when a car reverses towards us, we immediately become wary and defensive, and begin to assume diving positions to launch ourselves out of the car’s way. While these people are often reversing towards us to offer us assistance, the slight arrhythmia in our hearts it causes is rarely worth the free water. And what a shocking realization it becomes. That living the dream of the 60’s will catch up to you by the late aughts. We’re looking forward to San Francisco already. Hope your reentry to walking is going well. Love the pictures, updates, and all the folks who have been so kind to you. You continue to be role models in goal setting and perseverance to all who know you and to those who have learned about your walk. Haha, not sure if there are any real hippies left in SF, except for those who, to speak in Neil Young’s words, “became park bench mutations”. You can, however, visit a fancy hippie exhibit there at the De Young Museum, celebrating the “Summer of Love”. Happy walking!